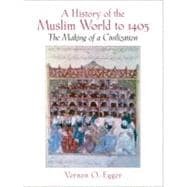 This book is an introduction to the history of the Muslim world for readers with little or no knowledge of the subject. It points out the unifying elements that bind together the Muslim world, but stresses the religious and political differences that prevent them from acting as a unit.This book features economic, political, intellectual, and social developments over the wide area of the Muslim world and across many centuries.For readers interested in learning the history of the Muslim world; also, for employees of corporations and businesses that trade with regions ruled by Muslim-dominated governments. The End of the "Golden Age"? The "Closing of the Gate of Ijtihad"?